Disney NASCAR show coming in January. Mickey and the Roadster Racers is an upcoming American animated children’s television series produced by Disney Television Animation. The Disney show features many NASCAR drivers along side Mickey Mouse, Minnie Mouse, Goofy, Donald Duck, Daisy Duck and Pluto. Two NASCAR champions and Danica Patrick bring the stock car racing world to Disney. Jeff Gordon and the 2016 NASCAR Cup Series champion Jimmie Johnson will star with Danica Patrick on the new show. The driver’s will voice their own characters on the new Disney production. 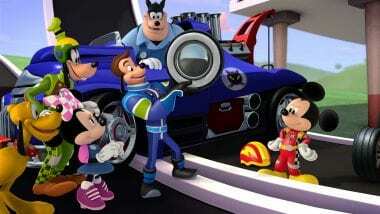 The new Disney NASCAR show Mickey and the Roadster Racers is a successor to Mickey Mouse Clubhouse. The new tv series will use a combination of CGI animation as well as live-action footage. Mickey Mouse Clubhouse is a fully computer-animated alternative. Airing Jan. 15 on Disney Junior. NASCAR stars Jimmie Johnson, Danica Patrick and Jeff Gordon recur as race car drivers Jiminy Johnson, Danni Sue and Gordon Gear in this new Disney Junior animated series. Mickey and the Roadster Racers will feature more than just NASCAR Stars on the Disney Junior show. Other celebrity guests will include Jay Leno, Tim Gunn, Tony Shalhoub, Jane Leeves, Gordon Ramsay and Patton Oswalt. Disney Junior is an American digital cable and satellite television network that is owned by the Disney Channels Worldwide division of the Disney–ABC Television Group. Together a unit of the Disney Media Networks division of The Walt Disney Company. Disney Junior is channel aimed mainly at children 8 years and under. Disney Junior programming consists of original first-run television series. In addition, it hosts theatrically-released and made-for-DVD movies and select other third-party programming. As of February 2015, Disney Junior was available to approximately 74,972,000 households. That number was the equivalent of 64.4% of those with television in the United States. “Mickey and the Roadster Racers” will debut 9 a.m. EDT Sunday, Jan. 15, on the Disney Junior.